Urbanization, population growth, and a heavy emphasis on the Internet are perhaps not the factors you’d expect to fuel the next food revolution. MIT’s Open Agriculture Initiative is drawing on the very societal changes that have distanced average citizens from traditional agriculture to close the gap in knowledge and control what we eat. As the principal investigator of the project, Caleb Harper, explains in his TED Talk, the concept has two main components. 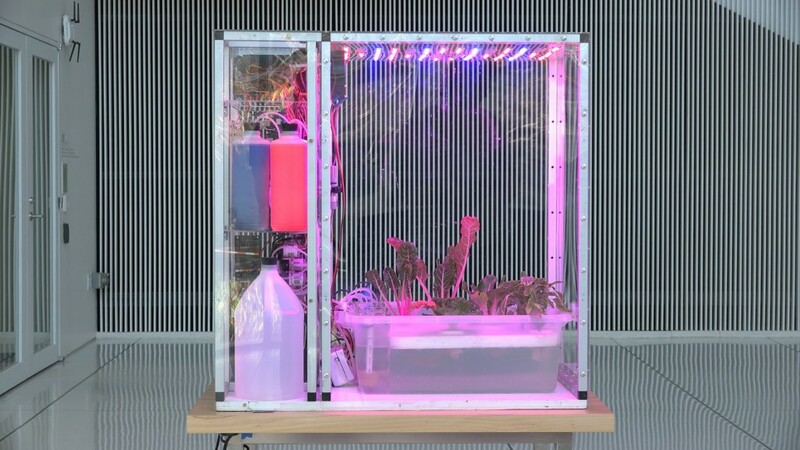 The first is the “Food Computer,” an indoor controlled environment used to grow produce using a specific “climate recipe” of specifications tailored to each plant. These recipes come from the second – perhaps even more revolutionary – part of the project: an open-source platform where farming information and instructions can be shared online across the entire user community. MIT’s Media Lab is a place, Harper himself pointed out, “historically known not for anything about biology, but everything about digital life.” Though it’s an untraditional source for a proposed solution to the global food crisis – something that raises a few eyebrows in the horticultural community – OpenAg’s strong computer-based foundation is what sets it apart. Modern advances in computing power are so rapid they are often modeled as exponential. In the past 10 years, American social media usage has increased almost tenfold, according to Pew Research. The constant sharing of our experiences and ideas, using that increasingly affordable and powerful computer networking, is a telltale characteristic of today’s younger generations. The idea of the climate recipe applies these patterns to food production. A food computer can manipulate variables such as humidity, temperature, oxygen, and carbon dioxide levels, and monitor each plant’s response to an extent not possible in outdoor farms. This yields a precise formula for how to obtain larger, tastier crops. With the correct equipment in place, this climate recipe can be shared and improved upon globally, allowing a dialogue between trained experts, students, and civilians about the food we all eat. According to the UN’s 2014 World Urbanization Prospects report, 54 percent of the global population lives in urban areas, up from 30 percent in 1950. This figure is expected to increase to 66 percent by 2050. When OpenAg states a mission to “create more farmers” they’re not talking about opposing this global trend by transplanting people back to rural areas – they hope to bring farms into cities. One of OpenAg’s Food Computers could bring a small-scale farm of sorts into the home, apartment, or classroom, with no outdoor space required. Taking this a step further, OpenAg has proposed larger models: the mid-sized “Food Server” could supply a restaurant, and the even bigger “Food Data Center” could provide a distributor with supply locally, reducing costly transport. The efficiency of modern urban life comes with its own set of sustainability challenges, and when it comes to food, transportation is huge. An analysis by the Natural Resources Defense Council found that food transported into the state of California alone results in almost 250 thousand tons of greenhouse gas emissions each year, and an often-cited statistic from Iowa State University states that food travels an average of 1,500 miles from farm to table. It’s true that figures like these are estimates calculated from limited samples – but the important takeaway is that our food travels quite far to reach us and harms the environment on the way. If average people could grow almost any type of produce in a box in their own homes, the size of this issue could be significantly reduced. Taking food production indoors also could lift considerable weight from the environment when it comes to habitat loss. According to the World Wildlife Fund, about 50 percent of the habitable land on Earth has been converted into farms, or 38 percent of its overall land area. Indoor farming technologies such as those posited by OpenAg and others already in action, such as urban farming company Aerofarms, allow a more efficient use of space. Additionally, vertical farming — the ability to expand farming in all directions of 3D space, not just along the ground — is gaining popularity for indoor farming operations. With its technology foundation set, OpenAg’s next challenge is to make the jump to the general market. According to its website, version 2 of the Food Computer is currently in production, though none of OpenAg’s members were able to comment on when they believe their proposed cheaper, more user-friendly version will be available, or what exactly it will cost. But it is possible for a determined individual to build and run a Food Computer today. Until it’s available commercially, instructions for so-called “nerd farmers” to build their own are available online. This growing community has expanded to six continents, and visitors to the project’s forum number in the thousands.